Ube Pastillas Recipe – The origin of Pastillas de leche, which is Spanish for “milk tablets”, is murky—some historians think the Spanish name was used to put a little insulares twist on a native favorite. Nevertheless, this delicious simple mixture of sugar and milk—traditionally carabao milk—is boiled down to a thickened paste and rolled in more sugar, before it is shaped and wrapped in colorful cellophane or papel de hapon. It can be made more granular or chewy in texture depending on your preference. This delightful piece of heaven is often attributed to the province of Bulacan, which is still the pastillas-making capital of the country. Cow’s milk or evaporated milk are often substituted here, and these are chock-full of protein, calcium and vitamins C and D. If you choose to go traditional, carabao’s milk may have more fat and calories, but it has 58% more calcium and 43% protein than cow’s milk. Ube is a welcome addition to this sweet treat. Apart from giving it a lovely violet hue, adding ube imparts a rich taste and texture with almost no fat—and Ube has Vitamins A and C and potassium, which have antioxidant properties. Who knew something that tastes so sinful could be so good for you? First, you need to clean, peel and slice the ube and put it in a large casserole with just enough water to cover the ube. Pre-boil ube over medium heat until tender. Strain in a colander and let it cool down completely before mashing. For a sweeter and smoother version use ube halaya and add 1 cup powdered milk for extra creaminess. In a non-stick casserole or pan, combine ube and sweetened condensed milk and mix with a wooden spoon. Cook over low heat and stir constantly to avoid the mixture from burning. Constantly mix the ube until becomes thick, smooth and shiny. When your ube mixture doesn’t stick to the pan and starts to form soft dough you’re done, remove from the fire. 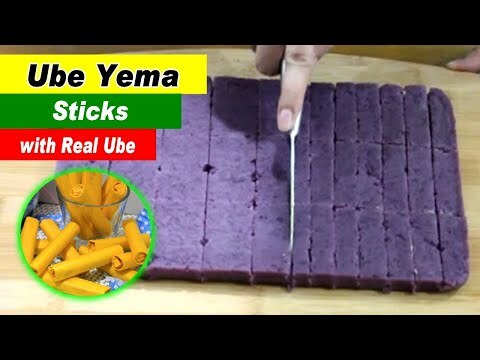 Transfer the ube pastillas in a greased pan (I’m using a brownie pan) and flatten the entire mixture using a greased spatula or any similar utensil that you find easy to use. Set aside and let it cool completely before cutting into bite-size pieces. Using a greased knife, slice ube pastillas according to your size preference. Roll Ube pastillas lightly with sugar and shake off extra sugar. Repeat until you’re done with the ube pastillas and set aside. Measure the size of your pastels (Mine was 1cm x 6cm), bond paper (7.5cm x8cm) & colored paper (10cm x 13cm). Wrap on prepared wrappers: First, wrap pastillas in bond paper, then cover with a colored paper or cellophane, twist and tuck both ends to seal. You can also use paper liners and clear cellophane for a fancy wrapping. This delightful piece of heaven, Ube Pastillas Recipe has some antioxidant properties. I have never heard of this before. Sounds pretty easy to make, thanks for sharing. I feel like you make this look a lot easier than it really is! Haha. But I will definitely try it, thank you for sharing all these great recipes!